The Becket Fund challenged a Texas prison to defend a Jewish inmate's right to a kosher diet. Moussazadeh v. Texas Department of Criminal Justice. The Becket Fund for Religious Liberty (n.d.). Retrieved from https://www.becketlaw.org/case/moussazadeh/. Moussazadeh v. Texas Department of Criminal Justice. (Apr. 04, 2019). https://www.becketlaw.org/case/moussazadeh/. "Moussazadeh v. Texas Department of Criminal Justice." The Becket Fund for Religious Liberty. Accessed [Apr. 04, 2019]. https://www.becketlaw.org/case/moussazadeh/. Prisoners lose many of their physical rights when they enter prison, but they do not lose their dignity. They may be unpopular, but they still have human rights. The Religious Land Use and Institutionalized Person Act (RLUIPA) was established to protect those rights. Congress unanimously passed RLUIPA in 2000 because prison bureaucrats around the country were arbitrarily banning Bible studies, confiscating sacred texts, denying access to the sacraments, and prohibiting religious diets to prisoners. These arbitrary bans not only undermined the rehabilitation of prisoners, but also stripped them of their dignity by denying their right to seek God. Max Moussazadeh is an Orthodox Jew who was imprisoned in Texas and denied kosher meals. In October 2005, Becket sued the State of Texas on Mr. Moussazedeh’s behalf, arguing that the state was arbitrarily denying Mr. Moussazadeh’s religious freedom in violation of RLUIPA. The vast majority of prison systems across the U.S. provide Jewish prisoners with kosher meals, and have done so for many years. 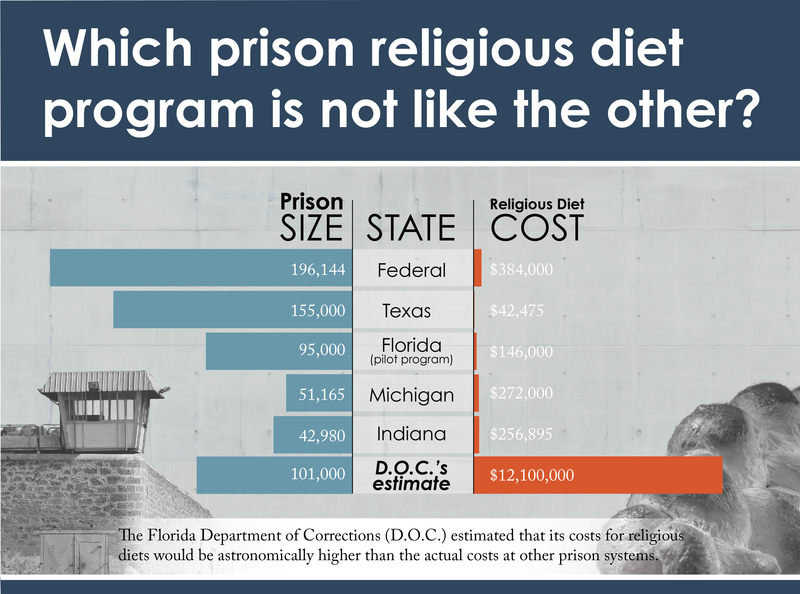 Texas could do so at a cost of less than 0.02% of the prison system’s annual food budget. Thanks to Becket’s and Latham & Watkins’ lawsuit — which lasted twelve years and included two victories at the U.S. Court of Appeals for the Fifth Circuit — the Texas prison system established a kosher diet plan and began providing Mr. Moussazadeh and all Orthodox Jewish inmates with kosher meals. Mr. Moussazadeh then put his lawsuit on hold, and ultimately dropped the lawsuit in 2017 after being released from prison. Becket has also brought successful kosher meal cases against the states of Florida and Georgia, and assisted in a similar victory against Indiana. In 2015, it won a unanimous Supreme Court victory in Holt v. Hobbs, a landmark case protecting the right of all prisoners to peacefully practice their faith.